Using the basic SEO scan you can now find out why your competitor(s) rank higher in Google than your website does. 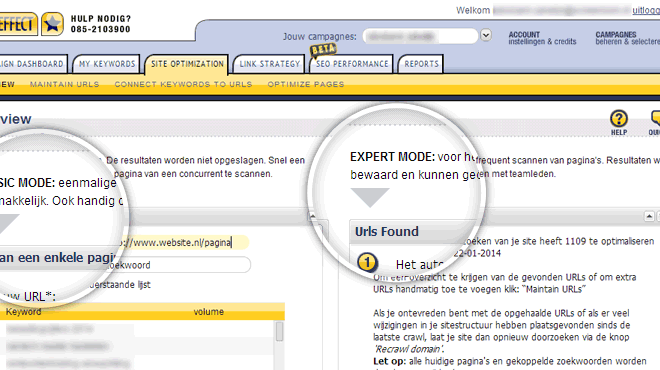 Up till now you could only thoroughly analyse your own website. How does a one-shot page scan work? Log in, choose your campaign and go to ‘site optimization’. Insert the URL of your own or a competitor’s website. Choose a keyword from your list or fill in one yourself. Start the page scan and there you go: your results. You immediately receive a list with points of improvement. The points that will help your website most, are at the top of the list. Work your way through the list from the top down and have your articles rank in Google! Are you doing a page scan for a competitor’s website? Then learn from the points on which their site is performing better than yours.